If you're doing some holiday gift shopping for a Boston Terrier dog lover, don't miss the Boston Terrier dog jewelry and Christmas ornaments at For Love of a Dog. Each item is handmade and most are one of a kind. Shown above is an adorable Boston Terrier dog necklace with artisan lampwork beads and red crystal rondelles. I love how the lampwork glass Boston Terrier's eyes are looking to the side. The Boston Terrier dog pin shown below is a real work of sculpture art. Two dimensional (flat on back) and hand crafted. The whimsical Boston Terrier dog necklace shown below has a removable pendant to wear solo as a pin. It's also one of a kind and will not be reproduced. Although dog breed Christmas ornaments are selling out fast at For Love of a Dog, you can still snag this gorgeous Boston Terrier dog Christmas ornament. It would make a barking good holiday gift. 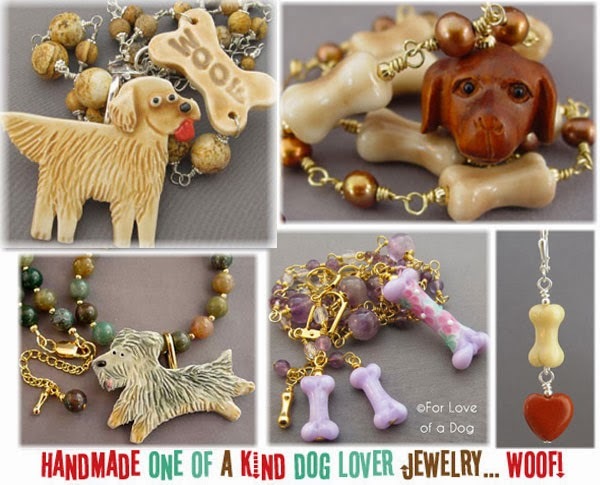 Be sure to check out the other dog breed jewelry, too, for fantastic dog lover gifts. for handmade, one of a kind jewelry and gifts for dog lovers. that top piece is adorable.